Movie theater anti-piracy tech is getting a novel tweak that means it’ll watch audiences to see how they react to movies and adverts. The silver screen is set to watch you back. Movie theater technology is getting a novel tweak–it’ll start watching audiences to see how they react to movies and ads. The silver screen is set to watch you back, and it’s all in the cause of market research. Some theaters have already been watching you for years, but only to make sure you’re not recording the show. Cameras embedded in the screen can detect the tell-tale infra-red signature of a digital camera. But that was just the first step. Aralia Systems, a U.K. high-tech security firm, just earned nearly $350,000 in a grant from the University of the West of England to turn those cameras into a system for gauging audience reaction to films and advertising. We’re not talking about a dumb clapometer-style system, either. The intention is to produce rich data that can measure the details of an individual’s face. Aralia will leverage 3-D face recognition technology that the university is already developing. 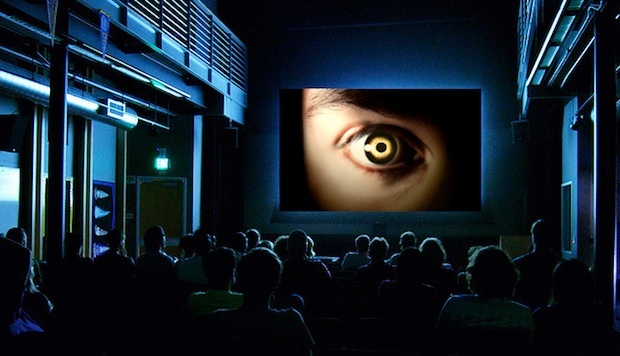 When you sit in the audience of a theater with their system, you’ll be illuminated with an infra-red beam, and three or more cameras will continually monitor the crowd to create stereoscopic images–just like the 3-D digital cameras that are now launching on the consumer markets. The system should be able to detect a great deal. It will know the direction your face is pointing in, your expression, whether you’re shocked by something, whether you’re sitting in a family group or on your own, at what point you get bored, and so on. This is invaluable data for marketers, who can gauge how well their ad messages are getting across. Potentially, they could change the ad’s placement in the reel between showings to see if they get a better reaction. And it isn’t just the ad reel, of course. Movie studios have been running test screenings for years–they’d love to get a sense of which scenes to cut, without having to go through the fuss of having audiences fill out surveys. Of course, as with any intrusive technology, there is plenty of dangerous potential here. We’re not just talking about dangers to privacy–the cameras won’t necessarily care who you are, just how you react–but the danger of focus-group thinking infecting the creative process.